What Are the Causes of the Decline of the Nine-Spotted Beetle? The nine-spotted beetle is a ladybug beetle who gets her name from the nine spots on her wings. Over the past few decades, the insect's numbers have been mysteriously declining. The intrusion of other insects and humans into this beetle's habitats has resulted in possible causes for population decline. Until the mid-1970s, the nine-spotted beetle was one of the most common ladybug beetles. To the delight of farmers that welcomed the fact that these beetles ate pest insects such as aphids, nine-spotted beetles were prevalent on farms. However, they suddenly began to disappear in large numbers. The nine-spotted beetle was even thought to be extinct by some entomologists, because a lapse of 14 years separated sightings. These bug-studying scientists came up with four major reasons for this population decline. The nine-spotted beetle, also called C-9 by entomologists who have documented the insect's declining numbers, may have begun declining from competition for her food sources. Though the nine-spotted beetle was once common throughout the United States and in southern parts of Canada, other beetles such as the seven-spotted lady beetle and various Asian beetle varieties have moved into these areas, creating competition for food. Like the nine-spotted beetle, the invading beetles feed off the same insect food sources, including aphids, mites and leaf hoppers. With her plentiful spots, red coloration and reputation as being a good luck symbol, the nine-spotted beetle became New York's official state insect in 1989. 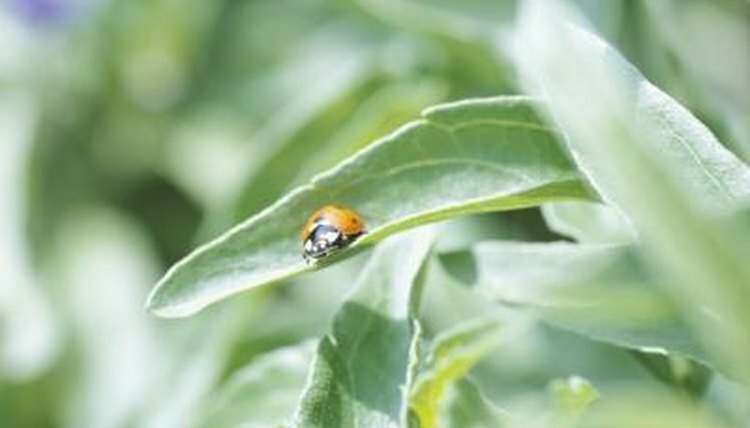 However, this spotted ladybug beetle has not been so lucky. Another possible reason that entomologists site for her population decline is that the nine-spotted beetle herself may have become a source of food for other insects that have invaded her natural habits of farmlands, gardens, pastures and wooded areas. As they began moving into these areas beginning in the mid-1970s, invading insects possibly began devouring the nine-spotted beetle. Another possible cause of the declining numbers of the nine-spotted beetle is disease. Insects such as other types of beetles that had not previously lived in the same regions as the nine-spotted beetle may have introduced bacteria and viruses to which she had no natural immunity. Because the invading insects were immune to these potential illnesses, they possibly began to thrive while the nine-spotted beetle began to get ill and die. The nine-spotted beetle commonly made her home on farmlands for the rich source of insects these regions provided. However, coinciding with the decades that this insect's numbers have been declining, so has farmland acreage across the regions where the nine-spotted beetle use to be prevalent. In the last 20 years alone, the United States has had a decline of approximately 8 percent in acreage per farm and continues to lose almost 3,000 farmland acres daily. The rising human population moving into once-rural areas has increased urbanization, eliminated farmland and decreased crops that use to attract the insects that were diet staples for the nine-spotted beetle, and possibly resulting in her declining population. Why Are Arthropods Important to Humans? What Are the Reasons That the Checkerspot Butterfly Population Is Declining? What Are the Causes of Endangered Honey Bees? What Types of Insects Can Chickens Eat? How Long Will Butterflies Live After Mating?